If you want to have a meaningful engagement with attendees in your booth, the first thing you have to do, after you get them there, is to encourage them to stick around. After all, your booth is an ideal touch point for cementing face-to-face relationships and providing hands-on information about your product or service. 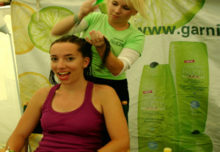 But you’re competing with hundreds of other exhibitors for the attendees’ time and attention. The industry average for time spent in a booth is about seven minutes, according to Brook Salomon, director at Dell Global Alliance Events. So, how do you get attendees to kick back and spend some quality time? Read on for some ideas. The first and most obvious way is to staff your booth with top-notch personnel who are trained in customer engagement conversations and have the knowledge to answer attendees’ questions. “It may sound like marketing 101, but sometimes when it comes to staffing, it’s whoever can make it to the show,” says Salomon. To avoid this, Salomon plans a year in advance in order to get on the calendar of people she needs to have in the booth. She also strives to strike a balance between marketing-oriented and technical staffers. And, to improve the quality of interactions in the booth, she has pulled together a comprehensive training program for staffers. These initiatives have had a positive impact on dwell time in Dell’s booth, where attendees spend an average of 10 minutes—three minutes longer than the industry norm. “Any longer than that and you really need to set up more time for them to come back for a white boarding session,” says Salomon. Using iPads and other tablets can lengthen your attendee engagement. Not only do they reduce shipping costs by eliminating hard-copy brochures and other collateral that exhibitors traditionally lug to trade shows, they allow for a more personalized conversation. Tablets also are more customizable than other booth elements such as static graphics or looping panels that deliver the same information over and over again. Hospitality areas are going high-tech with iPads and other tablets along with their comfortable couches and latte machines. The tablet is built into customized, modern-looking stands next to loveseats or large chairs and attached with a retractable cord so guests can hold it as they would a book or magazine and flip through the data. These lounges are a great way to increase engagement with attendees. Cutting-edge exhibitors also are offering closed-loop wi-fi within their booths, a cool way to engage attendees by inviting them to join their network. Closed-loop wi-fi increases the booth’s “sticky” factor because attendees tend to stay longer as they catch up on email and surf the web. Another way to increase stickiness: incorporating power charging stations into the booth. Trade show producers have long recognized the value of offering charging stations near session rooms and in hallways, but bringing them into the booth is a smart strategy. After all, attendees waiting for their phones or tablets to recharge will remain in the booth for up to 20 minutes, a perfect time for face-to-face engagement with sales reps.
Power charging stations are also popping up in hospitality areas. 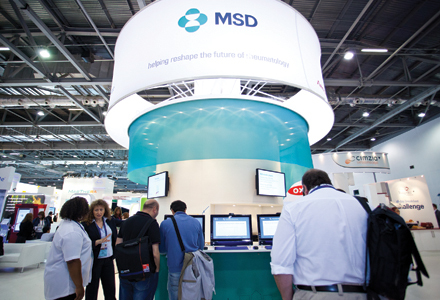 “The charging stations increase attendees’ willingness to engage in conversation and extend the conversation and opportunity for learning and detailing,” says Boncek, whose client Merck, known globally as MSD, incorporated them last year into its booth at a European rheumatology convention. People like anything personal, a trend that exhibitors in the health care realm have tapped into by offering digital posters that a physician creates in-booth, then takes home to hang in the office to educate patients about a particular disease. The posters, which measure 11×17 or 16×20, are pre-printed with information about the disease and its symptoms. The physician’s photo and practice information are captured and added to the top of the poster, which is then printed in the booth. While waiting for the poster to print, booth reps have another opportunity to engage the physician. And the poster goes into a tube printed with the company’s logo on it, giving exhibitors additional visibility on the show floor. “This is one of the best methods of drawing in physicians,” says Boncek, who used it regularly at medical trade shows last year. “It promotes them as an expert and can be useful to the patient.” And it’s a tactic that could work in other industries as well.